See the beach girl at left? Her environment -- all the way down to her clothes -- are tricks of the light. This is her, pre-projection. Shots of underpants-clad people in bare rooms appear in these displays for Puma's ongoing Lift campaign ("Light injected footwear"). Somebody turns an out-of-sight overhead on -- and voila, the more colourful elements of life is projected onto them. Cool idea by Droga5; other campaign credits here. See street and surf guys. Also see the commercial, where a courting couple projects its desires onto the atmosphere. The song's appropriate in the context of these pieces. Don't Just Dab Your Mouth; THINK. We've all heard the legend that JK Rowling sketched the birth of Harry Potter out on a diner napkin while scratching by on welfare. The iconic "I Love New York" campaign was supposedly conceived in similarly humble circumstances -- on somebody's crumpled serviette. 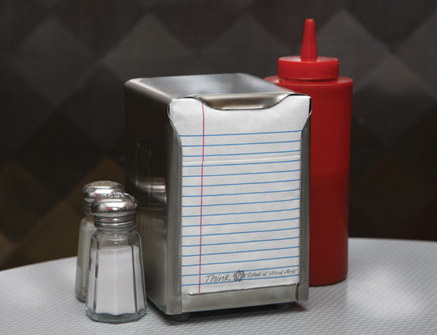 To leverage the power of this unlikely muse, the School of Visual Arts re-imagines diner napkins, toilet paper, sugar sachets and other incidental scraps as college-ruled paper. Across the bottom of each sheet is the message, "Think. School of Visual Arts." Nice, simple and instantly-engaging. We wish we had some doodle-worthy napkin now, and we're not sure we even remember how to use a pen. Work by Knarf/New York; more photos at Toxel.com. This short film on pretending to work was put together entirely on Microsoft Office for Mac -- which is more than what we can say for Crispin's "I'm a PC" campaign. We much prefer iWork, but MSFT Office for Mac does have its merits. Props to the magical, miraculous Krystalline Armendariz for taking it upon herself to share a few. To support her, pass the YouTube link around. You gotta forgive the quality of the imagery at left, but we couldn't leave this one alone. For a Macedonian testicular cancer awareness campaign, grabby paper hands were laid down on public seats or positioned suggestively over barber's gowns, snatchin'-the-manpouch style. The blunt "Check Them" message also appeared on eggs -- which made us feel decidedly wary about picking any up in the near future. Orchestrated by McCann Erickson for NGO Veritas Spiriti. 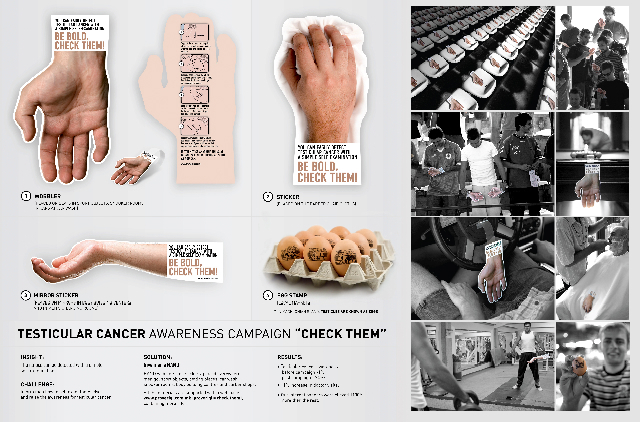 The work is also shortlisted in the "Best Targeted Campaign" category of this year's Festival of Media Awards. OMG! Actual Humans to Answer Phones! Hmm. Maybe it's like that scene in the Sylvester Stallone/Sandra Bullock movie Demolition Man where future cop answers the phone saying, "Hello, this is the Los Angeles police department. Press one for an automated attendant or stay on the line to speak to me" or something like that. VCCP Berlin has produced a commercial for O2 which depicts all sorts of robots in retirement with a voiceover that, OMG, you can now talk to an actual live human being when you call the company. Wow. How novel. How did we ever get to a place where insanely annoying phone trees became the norm? 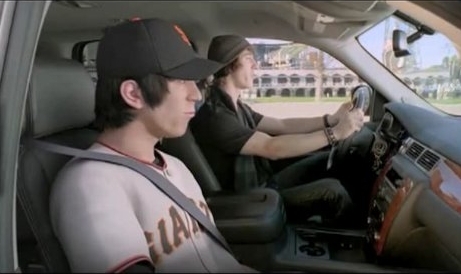 2K Sports promotes video game MLB2K9 with an ad where a Giants player schools his (adorably earnest) virtual self in both work and play. It's witty work, a big plus considering there's no genuinely exciting way to hype a video game about baseball. UPDATE: If you'd like a more mundane version of this piece, click here. Suicide Action Montreal needed to get its message of suicide prevention out to a jaded province. Faced with the challenge, the clever cats at Touche! phd, Sid Lee and Astral Media concluded there's no better way to illustrate suicide than to bring an abrupt end to things people like. The campaign rolled out in two ways. 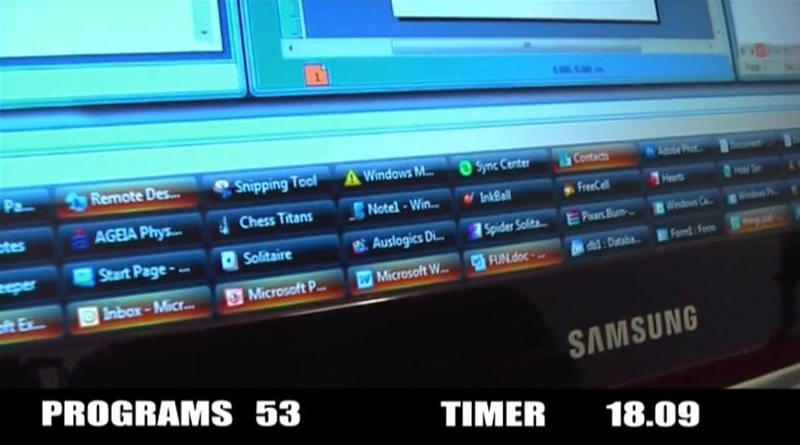 To start, popular programs randomly went black to make way for the following (roughly translated) message: "Does this premature ending surprise you? Imagine if it happened to the life of someone close." After a few seconds of darkness, the episodes started rolling again. Same thing happened with popular songs on the radio. Refreshingly out-of-box. Check out examples of both the TV and radio executions (bad pun!) on the Touche! phd blog. A Stirring Encounter of Coke Kind. McCann Erickson/Madrid's "Encounter" is an increasingly emotional progression toward the meeting of a centenerian and a just-born child. The music, timely words and that final culmination -- wedding the tail-end of a life to the naissance of new -- brought us near tears. And then we saw the Coca-Cola silhouette. And it was like, "Jesus Christ, this came from the same people that brought us Happiness Factory." Nothing against Coke, whose ads are consistently good, but there has to've been a more graceful way to incorporate the brand into this message. The New Samsung Hard Drive...Yawn...ZZZ...Oh Wait, This is Good! Oh wait! This is pretty good.